I have been laid up for a while, nothing serious but a stupid accident has kept me off my feet for a few weeks. As a result of this inactivity my knitting needles have been in overtime. 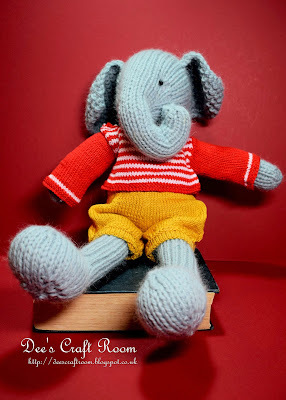 Before I start boring you with the huge pile of cardigans I have been making for my little nieces, I thought I would show you the elephant I made last Christmas for one of them. 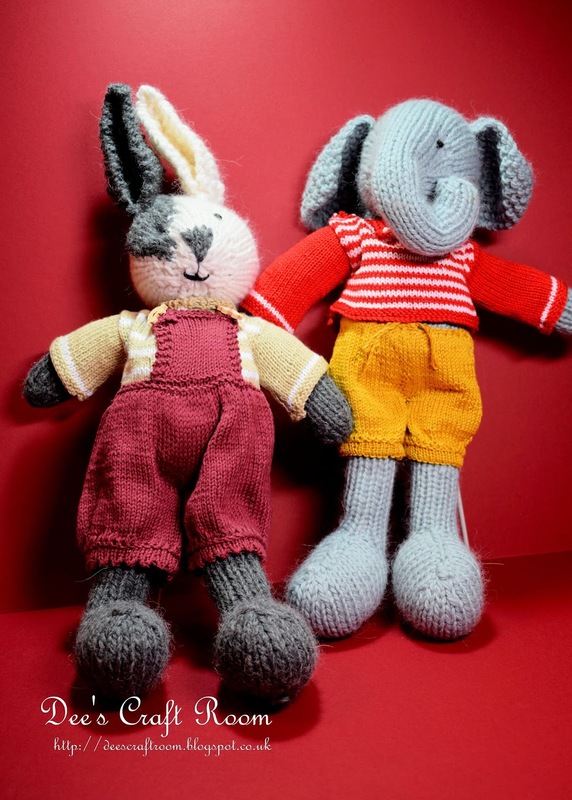 Do you renumber 'Big Bunny'? 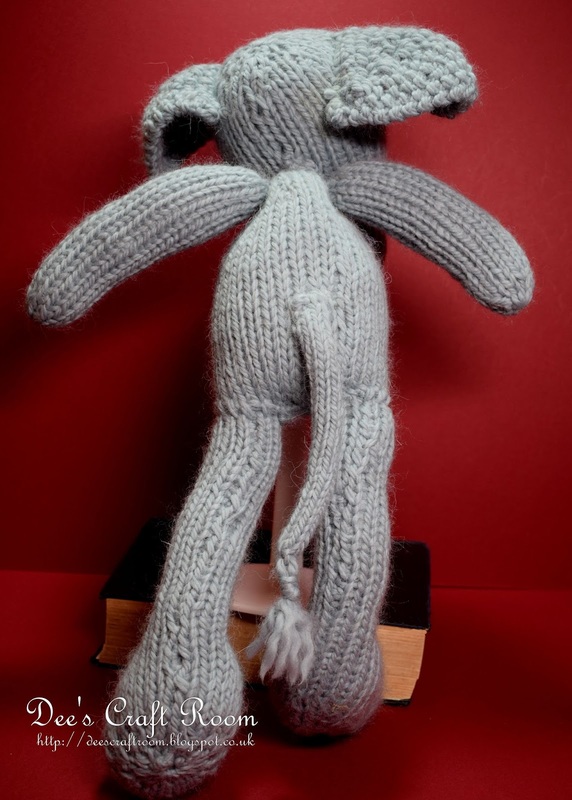 He was the extra large bunny I made using one of Julie Williams 'Little Cotton Rabbits' patterns with large needles and chunky yarn. 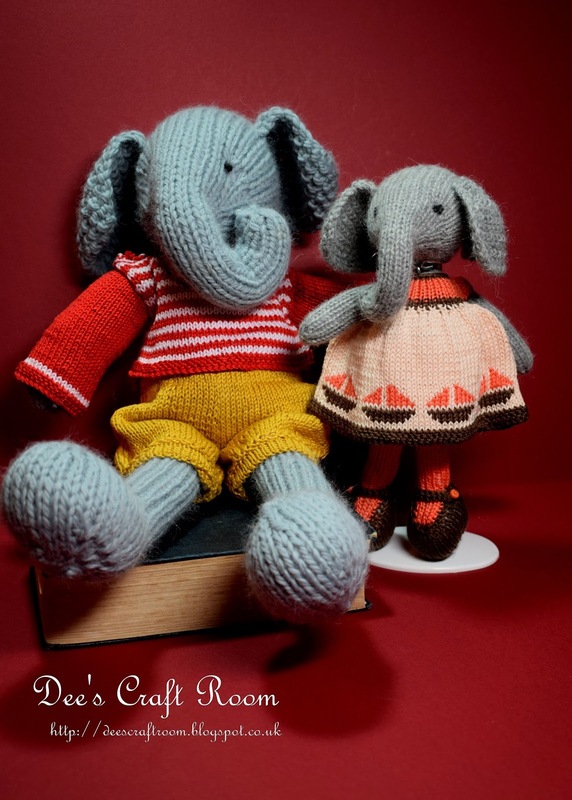 Well, I have done the same with her Boy Elephant pattern, I really love the result. Here are a couple of shots to show you how he looks under his clothes, as you can see these patterns are soundly designed and should stand up to all the tugging and dragging around a toddler will inflict on him. The yarn is wonderfully soft and he is really cuddly. His eyes are several French knots stitched one on top of the other. Just look at that cute tail. 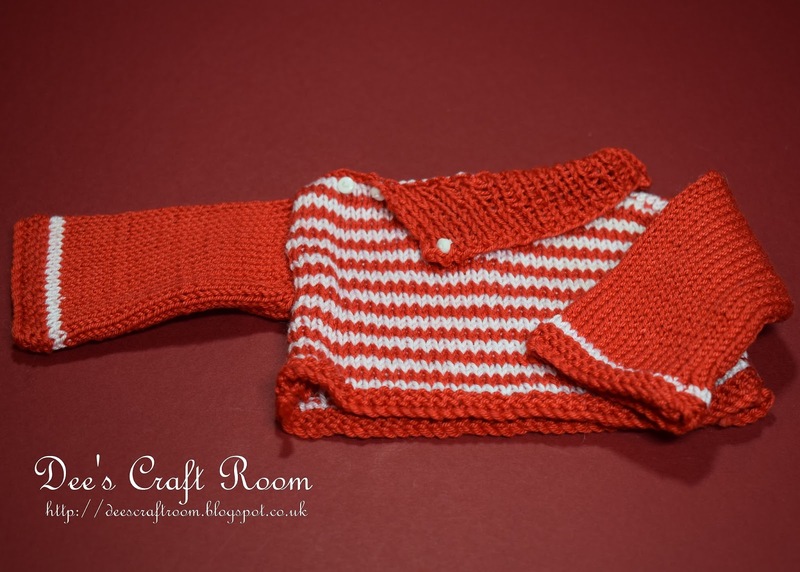 There are only 9 pieces to any of these toys, making them quick and easy to make and it is stunning how quickly chunky yarn knits up. Unfortunately, these oversized toys are too big for my stands, so I have had to use an old dictionary to give the stand more height (and even that was not really enough). I could not make the Boy Elephant clothes using chunky yarn, so instead I used one of Susan Hickson's Mary Jane's Tearoom patterns. 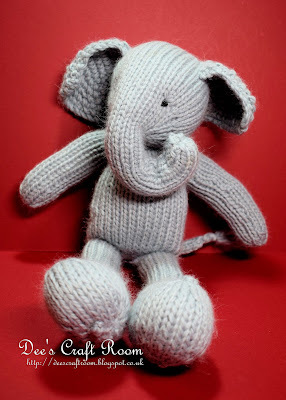 Although, I had to improvise the neckline of the jumper because the head of this elephant is very large. The trousers have a drawstring around the waist to ensure they stay in place, they also have a slit in the back to accommodate his tail. oh, and I could not resist showing you both of my big boys side by side. I am fine thank you Carol. Also, thank you so much for your very kind comments. You really are too kind. My accident was rather embarrassing and not at all serious, which is why I did not go into details, I am well on the way to recovery and hope to get the dressings off by the end of this week, but thank you for your concern. 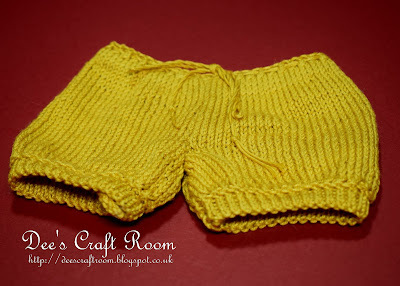 I have a handful of finished knitted projects but I need to photograph then, I must get my finger out. PS I think you may have invented adorablenessness, but I love it.